Angela had planned to go to a yarn swap yesterday (I know as much about these as you do, trust me) and had apparently volunteered me to make some sort of edible goodie. This isn’t that big of a deal but it’s helpful when she, you know, has some idea of what she’d like me to make. So I ran (well, slowly walked) to my cookbook shelf (scratch that, it fills up the entire bookcase now) and started to look through my collection. We started off with the idea that I’d make something savory (as apparently there’d be other sweet items) but that quickly fell by the wayside when we realized it’d be difficult to take something that was warm. Eventually I thought of whoopie pies. I reached for the Mennonite Community Cookbook, certain that the recipe would be in its spiral bound interior. Alas, I was mistaken. Despite the fact that my mom used to make them growing up and that I’ve always associated them with Mennonites (and by extension Pennsylvania-Dutch), it was not to be found in one of the foremost Mennonite culinary tomes. I did have a recipe for pumpkin whoopie pies that my aunt sent me but the sugar pumpkin I have is reserved for pumpkin pie (both of which will be feature on here later). So I resorted to the internet. And I ended up at Bella Online: The Voice of Women. Er, right. Voice of women. Okay. I’m just here for the recipe, thanks (this reminds me of the time I had to stop by Angela’s gynecologist to pick up a prescription for her; I’ve never gotten such looks of hatred in my life). The recipe itself was pretty close to what I remember (Epicurious uses marshmallow fluff which is simply wrong). My only problem was that the cookie part didn’t puff up to the height I’m used to. They are, however, quite good. Do be aware that the filling has raw egg whites in it (sadly, I had to tell my pregnant cousin not to eat any). And scooping the batter onto the cookie sheets makes quite a mess. 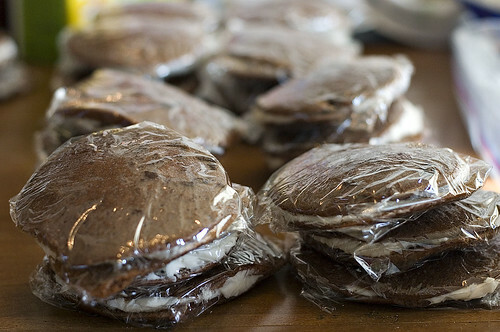 And there would’ve been more pictures but individual whoopie pies look a bit sad (or at least the ones I make do). Sift together the flour, baking soda, cocoa powder, and salt. In an electric mixer, beat the sugar, vegetable shortening, and eggs for about 2 minutes on medium speed. Slowly add the flour mixture. Add the milk, water, and vanilla and mix for 3 minutes. On an ungreased, nonstick baking sheet, place tablespoon full drops of batter. The batter will be very liquid and spread easily. Leave ample room between the drops. Bake for 10 to 12 minutes. Remove from the baking sheet and allow to cool on a wire rack. Beat together all the filling ingredients except for the egg whites in an electric mixer on medium speed until well combined. Fold the egg whites into the filling. Spread the filling on the bottom of a cooled cookie. Top with another cooled cookie. Wrap individually in plastic wrap.